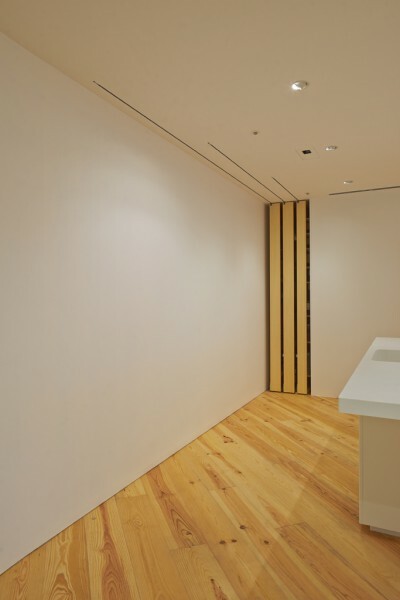 We designed the exhibition venue for Mitsui Fudosan Residential's "2020 Usual Home Exhibition." 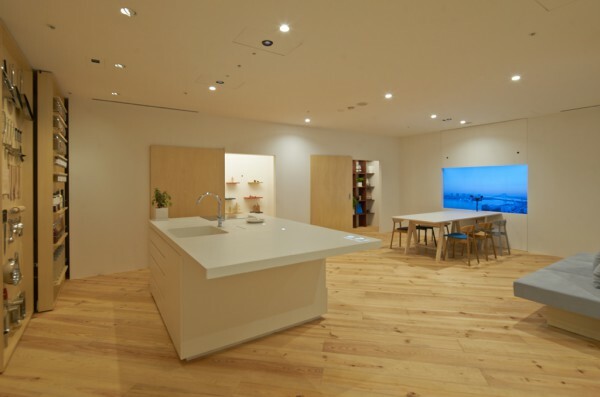 In a corner of the interactive Park Homes Imagination Museum in Tsukishima, we presented a universal home of the future concept easily conceivable by anyone using existing IT technology, with a theme that says "The future that exists a little far ahead, as an extension of the present everyday life." 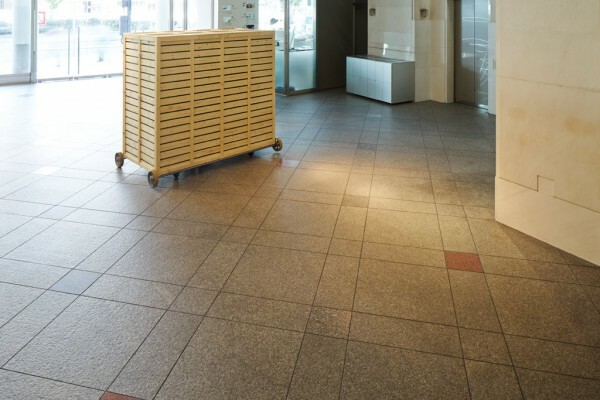 The four categories of media that can be experienced are the "memory table", "making space", "resounding door" and "connecting window", the content of which was designed by KAYAC, Inc. 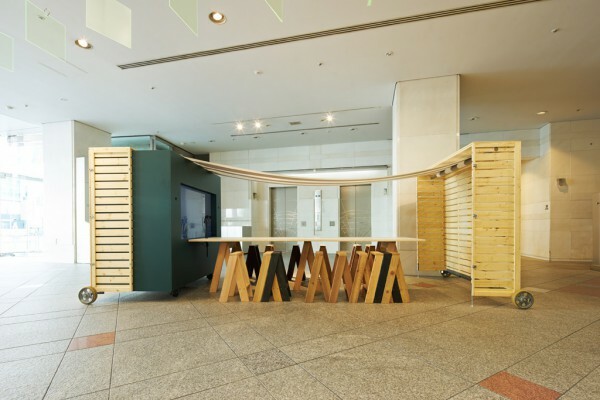 The venue is made of an indoor area where are exhibited these four interactive exhibits and an outdoor area where workshops are conducted with a curved wall seamlessly connecting both areas. 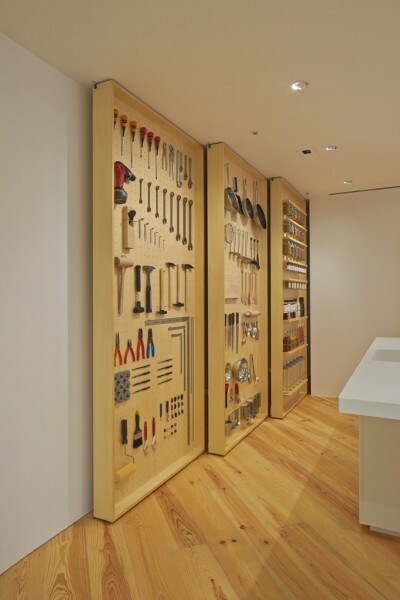 The wall is made of a thin steel sandwich panel that can serve as a canvas to display the result of a workshop using magnets. We strived to create a space where the house will become a partner for the members that live in it and will boost communication among them. This concept allows the reproduction of scenes recorded with a camera fixed to the ceiling by projecting them onto the table below. 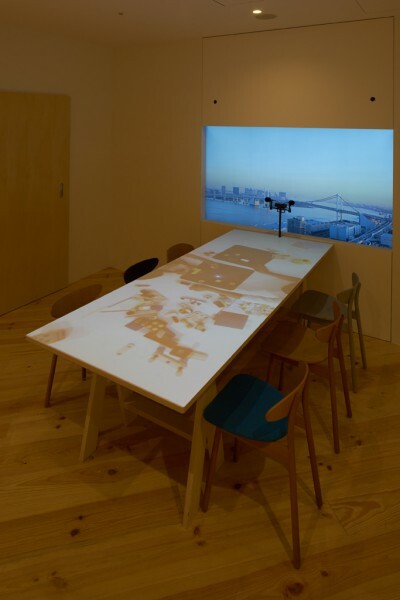 Thus, the table can retrieve the record of common scenes from everyday life as well as special events that were committed to the home's memory. 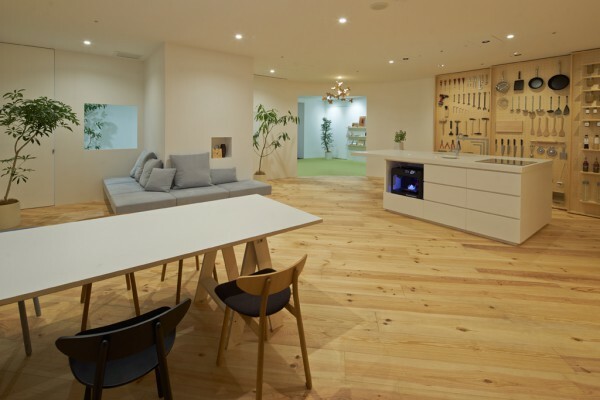 By viewing the kitchen as a place of creativity, this concept offers a space that can simultaneously be used for cooking food as well as for making things. 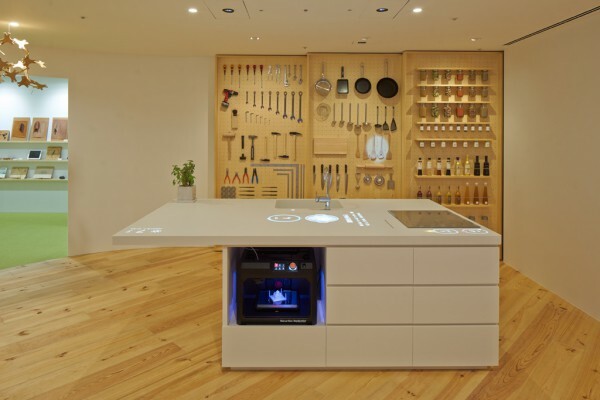 This area features sliding panels holding cooking implements and various types of tools, which can be all taken in at a glance as well as counter housing a 3D printer resembling a built-in dishwasher. 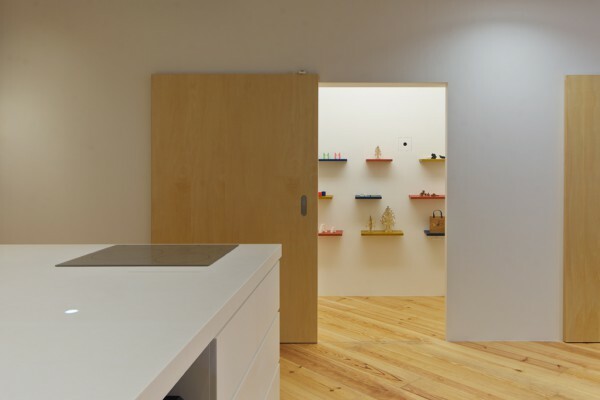 This concept presents a door that can play different sounds, such as the sound of a turbolift door or a rattling door, to suit one's mood on any given day by changing it like the ringtone of a mobile phone. The door can foster communication within the household by highlighting one's birthday by playing a birthday song. 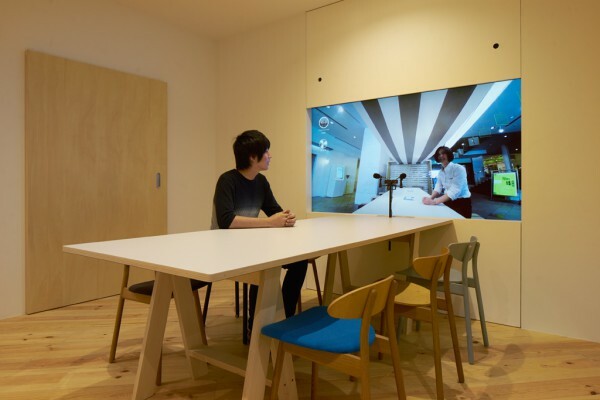 This concept offers the experience of sharing the same table as someone in a removed location through a large monitor contiguous to the "memory table" that resembles a window placed at table height. 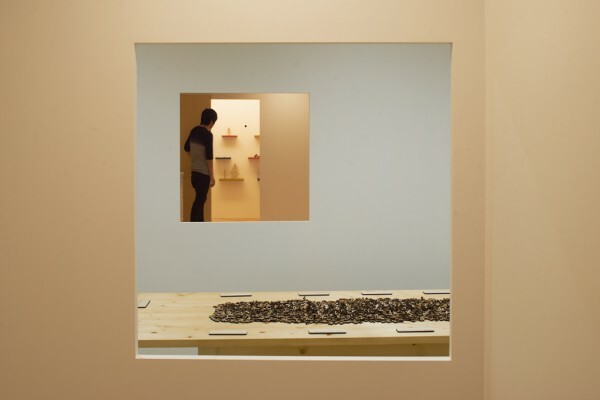 Using the "connecting window", we brought together visitors at the Park Homes Imagination Museum in Tsukishima with visitors at the "FUTURE EN-NICHI: Serendipitous coincidences" exhibition held at the same time at Spiral Garden in Aoyama. 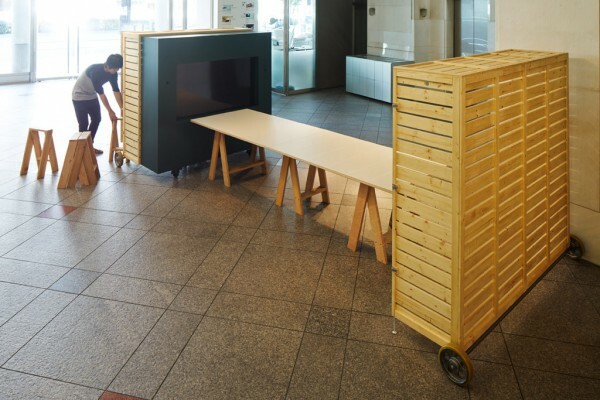 The "connecting window" in Spiral Garden was designed like a shipping crate fitted with stools and a table like a booth that can be transported anywhere in the world.